There is a dangerous consciousness that seeps into every aspect of our lives. It's everywhere on TV, in the streets we live in, it shows up in our schools, work place and almost everywhere you can think of. It's what I call police consciousness. It's a power hungry paranoid emotionless mindset, trained to think that everyone is dangerous and a self-survival mindset that represents quite often a complete breakaway from the simple humanity we are. It often acts without regret, fixates itself on what the end goal is, often disregards peace and quiet, stops traffic whenever it pleases, disrupts your personal life at will and predatorily combs the streets for reasons to pull your life into an interaction with the control system which usually ends up with you locked up or with your money being transferred to the control system. As with military and government, many individual people in police may have joined for good reasons. They may be good people who are simply not aware of the bigger psychological picture they are surrounded by which I speak of here. I hope some of those still-sane police read this and take it to heart to help their follow officers see this issue. In America today the hunt for criminals are now scarier than ever and even scarier than the criminals themselves. Americans are being accustomed to the scary lockdowns and "manhunts" all the time now. This is the nature of tyranny and the militarized police state. It's getting to the point where the average person today would probably rather deal with a potential criminal than a contingent of intimidating power hungry cops who act without consequences. Criminals are usually one or a small number of people without authority. There is also a good chance the criminal will be held accountable for their actions if caught. A well armed American can handle a perpetrator and thus the stress and fear of knowing there is a criminal on the loose is beginning to pale in comparison to the unsettling feeling of being surrounded by aggressive militarized unaccountable police. We are now dealing with a growing history of police and government bullying in America where the (bad) agents involved get away with murder and injustice all the time. As the police state gets worse I'm always wondering where are the police events and efforts organized by the good cops focused on attenuating the fear barrier that now exists between the average civilian and the police? Why is this not addressed? Where are the genuine efforts to uphold the Constitution? Where are the outspoken police willing to confront the issue of police violence and unchecked brutality? Where is the effort to stop the gangster mentality and have police mourn as a group whenever a civilian life is lost as well? The gap that now exists between police and the general public is as large as ever and it is contributing to the problem that they most don't even acknowledge is there. It was not long ago (June 2015) when the mainstream media enthusiastically pursued the story about 2 men who escaped from a New York state prison. Anyone awakened who followed this story from a psychological and human perspective may have noticed the projected urgency to "catch" the escaped prisoners took on an action movie, life or death feel to it. The media made sure to tell us how dangerous the men were and thus how important it was to catch them for YOUR safety of course. Throughout the coverage, mainstream media proudly showed the police "manhunt" with a sadistic sense of vengeance. This sinister and revengeful lust to capture the prisoners was projected to the general public and is very dangerous. It presented an opportunity to glorify the police state and the power of government over the individual. Before this story was over they murdered one of the men and shot the other before capturing him. Then the escapee was paraded all over the media as a gunned down trophy as if to say, this is what happens to anyone who challenges the systems cage. As I've stated in the past, one of the greatest deceptions about police work is the assumption that what police do is important. You may not have heard this before but think about it, police work is important only within the limits of the rare times that they are actually helping someone in need. 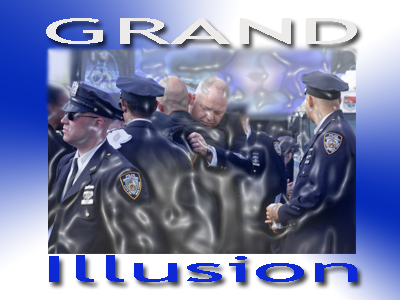 The illusion that everything they do is for "public safety" is simply not true. It is the nature of police work to search, capture and enforce thus generate revenue on behalf of the control system. That is why police are given quotas for how many tickets to give out which determines how many people they pull over, harass and arrest. Nowadays they also do dirty work for the federal government and fusion centers by filing SAR reports on innocent civilians. And only from this standpoint is their work important. This point was proven earlier in 2015 in New York City where NYPD went on strike and petty non-violent crimes dropped dramatically during that time. Yet despite all of this we are fully conditioned as Americans to worship police and assume that they are moral. Everyday in large cities we hear the sirens and we assume instinctively that the mission they are on must be important and moral. It's all part of the mass conditioning and we can thank Hollywood for this. There is no topic that Hollywood has touched with shows and movies over the last 5 to 6 decades more than the topic of police. The lesson in all this is that we need to look at events through the eyes of history not the eyes of mainstream media, Hollywood, politicians or the rest of the control system. Being mentally free from the control system means you start sounding different from others. It means you see more, you think logically and you are evolved mentally to see things as they are, not as the control system wants you to see it. Frankly, humanity has all the capabilities to live life without police or government for that matter. That's right. The illusion that government provides order and a civilized society for humanity to function in is also a lie. Try to overcome this illusion and understand that humanity has a long history of surviving without government. We are VERY capable of living a normal society without the institute of police. We are not wired to be stalked and bullied by control freaks, governmental systems and oppressive people with big guns, squad cars and military gear. The time has come to choose your paradigm now. It's freedom or enslavement. Choose we the people or the criminal politicians and their control system of governments now quickly expanding into a new world order global control system. I firmly believe the people will rise and be victorious. Humanity is too deep into this game and too many people awakened to not respond accordingly. Too many people know and understand what is happening. This does not stop the globalist from doing what they want but it will eventually have a big say in how far they can take this. In the end it's all about freedom and there are no situations where droves of militarized police should be seen as a good thing. Even when they are psychotically hunting down an escaped prisoner. Regardless of what you think, they are not here for we-the-people. So deep down whenever I hear of someone escaped from prison and I see the squadrons of cops with military gear I'm personally not rooting for police to catch the person and I don't fall for the drama. Yes, I know some psychopaths are really dangerous and don't deserve freedom but that's because they themselves are a threat to other peoples freedom. I'm certainly not calling for the release of violent prisoners. What I am saying is that these manhunts are not about justice or morality as it's sold to the public. Instead they are about power, control and revenge just like the Chris Dorner manhunt of 2013. Furthermore, there is no proof that prison does anything positive for a person so the very nature of prison is government exacting revenge and sinister punishment over the individual not about rehabilitating someone. No one benefits from imprisonment like the control system itself. There is no rehabilitation value to prison and instead there is evidence that today prisons are becoming corporate slaves for profit. A topic you'll never hear about when they are hunting down a runaway slave. So as you can see, when a slave runs away, that calls for action to show the other (prisoner) slaves what happens to runaway slaves. So keep that in mind the next time you are rooting for police and thinking that they are somehow doing you a favor and keeping you safe. The mainstream media's job is to keep you in fear and make you think police is here to protect you. Don't let these false narratives distort your deeper sense of history, morality, justice, and pursuit of basic human rights and freedom.